Here’s probably what is India’s first all-new 2018 Maruti Swift wearing 17 inch alloy wheels. The B-Segment hatchback, which was launched at the 2018 Auto Expo, is already being delivered to customers. One such customer from Delhi has fitted 17 inch alloy wheels to his car. 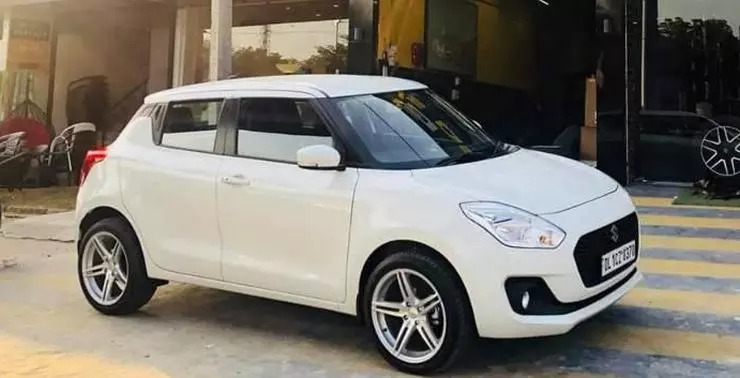 The Swift with the 17 inch rims looks quite good. We’re sure that more such modifications will come out in the coming months as the Swift is an extremely popular car in the modification circuit. You must remember that upsizing the rims will lead to suspension warranty of the car being denied should you have claim for warranty. Another danger of taller alloy rims is that ride quality could suffer as the tyres no longer have the same cushioning ability as they would have with taller sidewalls and smaller rims. If you go into a pothole at high speed in a car with tall rims and short tyre sidewalls, there is a good chance that such potholes will damage the rim, and may even cause a tyre burst. So, you have to careful when you go for such up-sizing. This is also the reason why car manufacturers stick to 16 inch alloy rims on most mass market cars in the interest of reliability. Coming to the 2018 Swift, the car is sold in India with 2 engine options – a 1.2 liter petrol and 1.3 liter diesel. Both engines are peppy and free revving but have completely different characters. The petrol engine, which makes its power high in the rpm band, needs to be revved to make the best out of its 82 Bhp and 113 Nm outputs. The diesel likes to deliver torque in a spike lower in the rpm band due to the turbocharger. The diesel makes 74 Bhp and 190 Nm. Both engines get 5 speed manual gearboxes as standard. AMT options are available on both engines. Prices of the new Swift start from Rs. 4.99 lakhs, ex-showroom Delhi.